From the National Museum: of Ethnography in Japan: “At the end of the Edo period, when the exhibited house was constructed, villagers of Akiyama mainly grew beans and such millet grains as cockspur, foxtail millet, and buckwheat. On the special occasion in the middle of January, called Little New Year, villagers made rice cakes in the shape of all these crops, stuck them on tree branches to depict an abundant harvest [see branches above with white blossoms], and prayed for a generous harvest in that year.” We’re a bit late, since this festival would have taken place a couple of weeks ago. But these sprays made from real branches studded with blossoms of rice cake or flour paste would be beautiful all year. 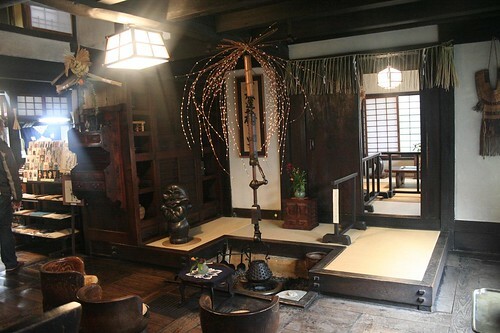 Years ago I saw a similar thing in the master potter Kawai Kanjiro‘s house, now a museum in Kyoto (below). The museum guide said that the flower arrangement was done by mixing a rice paste, colouring it pale pink and attaching and drying daubs of it to real branches. It’s very beautiful in person – the small bits of paste are abstract and crinkled, not actually flowers at all, but the effect is more flower-like than any fake flowers. It would be nice to try this, even if this form of sympathetic magic means nothing to a city dweller compared to what it would mean to a farmer worried about the year’s harvest. This entry was posted on Thursday, February 5th, 2009 at 12:00 am	and is filed under design. You can follow any responses to this entry through the RSS 2.0 feed. You can leave a response, or trackback from your own site.